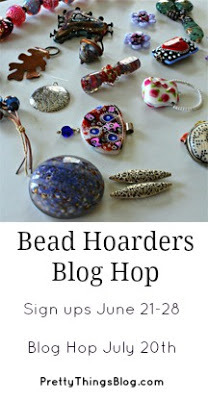 The anticipation is over, it's time for the Bead Hoarders Blog Hop hosted by Lori Anderson of the Pretty Things blog. I think bead hoarding is a malady which all jewelry artists suffer. The genius Lori decided to try to push us all to use some of that hoard with this hop. The beads I tend to hoard most often are art beads. Whether I've bought them from the designer themselves or won them in a giveaway, I usually just can't seem to bring myself to actually WORK with the beauties. I think I fear my inability to meet up with their awesomeness. For this challenge, I started by pulling out some of my stash from which to select. As time wore on, I narrowed it down to the beads below. I ended up only using three of those four selections, but I'm so pleased with what I was able to create that I'm hoping it keeps me on a roll to design with some of my other stashed away beads. My mom and grandmother watched me pull this one together as I visited with them. They oohhhed and aahhed all over it. I'd say that's one of the best votes of confidence I could get. 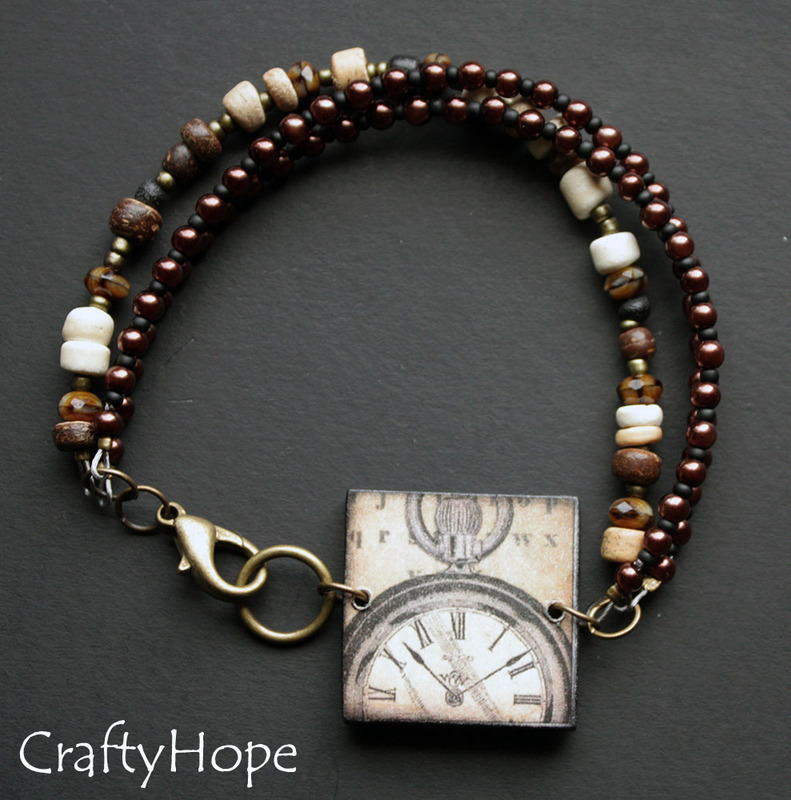 I really liked the idea of this charm/pendant used in a bracelet as a play on a watch. It makes me smile. This design is my favorite of the bunch. I wish I could capture the beauty of this pair better. Trust me, they're gorgeous! I may end up hoarding them this way now Ha! What are you waiting for!? Get to hoppin'! I love the designs you came up with, especially the necklace. That Gaea pendant is gorgeous and you did a wonderful job showcasing its awesomeness. Adlinah, Aw thanks! I really love that pendant and just hope I did it justice. I do love me some clouds! Thank you for hopping by. the earrings... colors look fantastic! 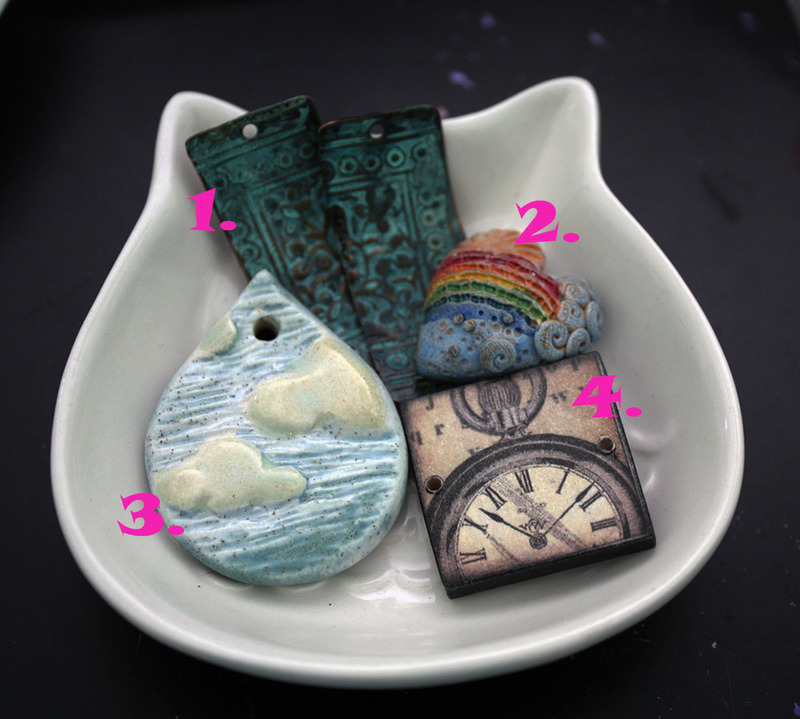 I LOVE the cloud focal necklace. It's GORGEOUS! Isn't this blog hop a great idea to help us all use the special beads we've been hoarding! Lizie, Yeah. You can see why I've been hoarding that one! I'm so glad Lori pushed us to use some of our favorites that are collecting dust. Thank you so much for your kind words and compliments. I appreciate it so! WOW Hope- I LOVE, love,love all 3 of these, but your new 'watch' is my favorite. Beautiful work and won't it be nice to actually wear some of our treasures?? Tammie, You're too sweet. Thank you! I actually wore the earrings last night. And, you're so right. It was a lot more fun that having those pieces sitting in a drawer almost forgotten. Thanks for stopping in! That cloud necklace is so sweet. Like the earrings too. Cece, Thanks! I like it too. I'm so happy I got something made with these awesome art beads bits. I appreciate you stopping in here! 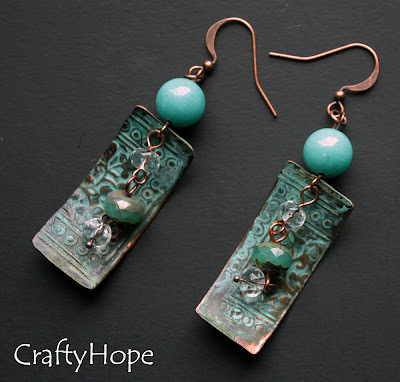 All three are wonderful designs - love those earrings! RC, Thank you so much. I have such a soft spot for those too. Who knew such a small item could garner so much attention!? Ha. Wow, I can't pick a favorite - I love them all. Awesome job!! Oh that watch bracelet is to die for. Being a retired nurse, have not worn a watch since then, but sure would wear this one! My favorite is the one with the watch, and the clouds. Such fun!!! Delicious earrings! I'd be hoarding them too! All very, very nice, Hope. These are all so lovely--those earrings are really calling me though :) Beautiful! Robyn, Thanks again! That turquoise blue is just dreamy isn't it!? Jacquie, Ha! That's such a great way to look at it. I'll have to keep that in mind when the hoard starts to become an issue. Thank you so much for you kind words and for popping by! Three very nice pieces. It's easy to see from the picture that those earrings are gorgeous. Ann, You are too sweet! Thanks so much. I love everything you did !!! I especially love the earrings. They are very cool. They have a great feel about them. Susan, Aw thanks! I've never really considered earrings to be something that required too much thought or design, but I'm so glad I paid a little more attention to these, as they seem to be stealing the show! ;) I very much appreciate your kind words. Christina, Awesome!! I do love your style so that's one of the best compliments you could give me. Thank you! Gorgeous pieces, but the earrings are awesome. Hi Hope! Those earrings are truly beautiful and if I had them iwould hang onto them too! Just gorgeous!! I don't know what stone you used with the pearls to pull off the fabulous cloud pendant, but what a perfect match!!! I also love your earrings - sooooooo pretty!!! Love your designs they are all beautiful but those earrings are stunning! Niky, Thanks! I think I've found the star of the show with those earrings. I'm so pleased you like them to. Thank you for swinging by! Miri, Awwww. . .you are too, too kind. I appreciate your support so much. Thank you! Love the raindrop. All great pieces! The last pair of earrings are my favorite, too! But you had some things in your pre-party stash that I had my eye on, like those enameled (?) purple flowers! Thanks so much for participating so enthusiastically! Love the soft coloring of the necklace and the bracelet is soo clever. Well done! Dana, Thanks so much! I had a ton of fun working with the pieces that had intimidated be before. I'm hoping it will break me out of the shell of hoarding, but I know that's not the case at all. Ha!! I appreciate you stopping in. Everything is just lovely, lovely, lovely! I can't pick a favorite. Thank you so much for sharing--I truly enjoyed seeing the beautiful things you created! That raindrop is adorable ! And I love the idea behind the earrings. A bigger version as a necklace might be quite fun ! I love your designs, Hope, and I just have to single out that "watch" as marvelously clever! I don't think many of us would get much done on challenges if it weren't for the "last minute" LOL. I love the idea you had for the bracelet! It's really fun. And I totally agree with everyone here: the earrings are gorgeous! Ambra, I'm so glad you like the bracelet. I was afraid it was a little corny, but I just love some whimsy. Thanks so much for your sweet words. It means more than you know! I do love the blue necklace and the earrings are beautiful. The bracelet is really unique. I had to laugh when I read the word "suffer." All to die for designs. Nice use of color and art beads. and I don't think the bracelet is "corny." My absolute favourite are the earrings, great pieces♥ beautiful to wear right now. I would hoard them too! Dini, Thank you so much! That means so much to me. I'm pleased that those earrings are being well-received. I had hoped it wasn't just me that would like them! Thanks for swinging by! The earring are my favorite! But also the other creations are very nice! Ilenia, Are those fab!? I hate to boast over something I made like that, but I love them too. I have a feeling I will probably list them in my shop at some time, but I'll have to bring myself to do it. Thank you! Hope you did great using some of your hoard. The cloud necklace is great but I agree that the earrings are my favorite. The other pieces are lovely and you have a fabulous sense of style! I'm with your Mom and Grandmom - I oohed and aahed over your pLe blue 'sky' necklace. Lush! Nelly, Aw. . .thank you! I was afraid I would have to make something more complex to compliment that pendant. I so glad simple worked! Thanks for checking it out! I love all three pieces .Your colors selection is beautiful,and lets not forget about the food.I am coming back to check the menu. Elise, Thank you so very much! I do like my food too. I'm way more motivated by food than I should be. I'm glad to see someone else is interested in my food ;) Thanks!! I don't blame them for cooing over your designs the first one is amazing. like little raindrops! JuLee, Thank you! I'll probably end up listing them. . .probably. But, I'm so pleased that I was able to make something so delectable! ;) Ha! Love all your creations, very pretty. Your bracelet with the watch focal especially caught my eye-my favorite. So much talent! They're all lovely, but I'm with you -- I'd have to keep those earrings for myself! Shalini, Thanks so very much!! I so glad you like what I made. It was hard to break down and use those hoarded beads, but I'm so happy I did. I appreciate you hopping by! 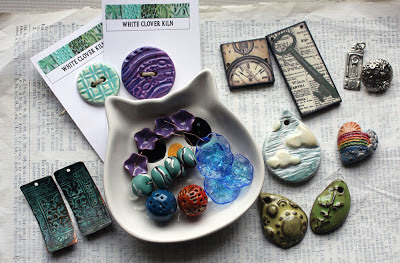 I am still 'oohing' over your art bead collection :) You chose well - and you did each of them justice. 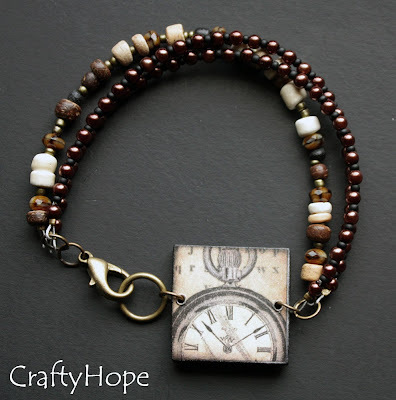 All three pieces are gorgeous: I love the beaded chain for that ceramic sky; Marie's time charm is just perfect on the bracelet; and Melinda's components are wonderful by themselves, yet you managed to make them stunning with your design. Beautiful work! You made three very beautiful pieces, I have to say my favorite are the blue earrings. 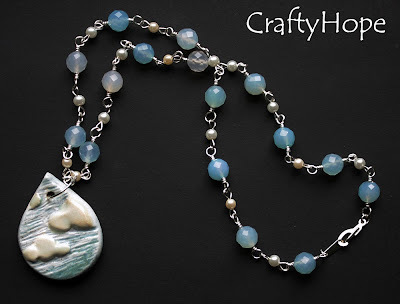 It IS a great way to get going with creating, and you have some more beautiful art beads in your collection. I hope you keep creating! It's very inspiring. I enjoyed your pieces, I thought I liked the bracelet the most, but really? I looked back again and think the earrings are my favorite... I don't know they are all lovely! Beautiful art, each piece is stunning! Sorry, I'm somewhat late. But I'm going to visit each and every blog in the blog hop. Love love love the earrings!!! Janine, No worries. I was adamant about visiting all of the blogs too. Take your time and enjoy the hopping. I'm so pleased you like my earrings and I appreciate you taking the effort to swing in and see what I was up to. Thank you! Kari, Thank you! I'm so glad you got a chance to pop by! As far as those earrings, they're already in the pile to sell and will probably stay there. Well, until I pull them out to take photos and fall in love with them all over again! ;) We'll see what happens. Thanks again.